When I was in eighth grade, one of the classes we had to take was West Virginia history, which also included some of the prehistory and natural history of the state. One thing I remember learning was that our rocks were simply too old to have any dinosaur fossils in them, and I was a little bit crushed. We had plenty of trilobite and fern fossils, but we were going to have to forget about coming across a T. rex. But then I came across a news item today that mentioned a rather old discovery in Ritchie County (just east of Parkersburg, for the geographically impaired). The news item mentioned that some tracks of a “pre-dinosaur” were found at the Hughes River Bridge in Berea, and that the rocks had been dated to the Permian, some 290 million years ago. I looked around online for the discovery, and I came across this paper. In 1927, there was road project in Ritchie County that happened to expose these tracks, but it took until 1929 for them to wind up in the hands of specialists who were able to identify it as a Dimetrodon. The species name is now Dimetrodon berea, for the little Ritchie County town in which it was found. For me, a Dimetrodon is actually a pretty amazing discovery. That’s because a Dimetrodon was actually more closely related to us than to any dinosaur. Like us, this animal was a synapsid, and synapsids have a single temporal fenestra. There used to be many different lineages of synapsids, but currently only us mammals survive. 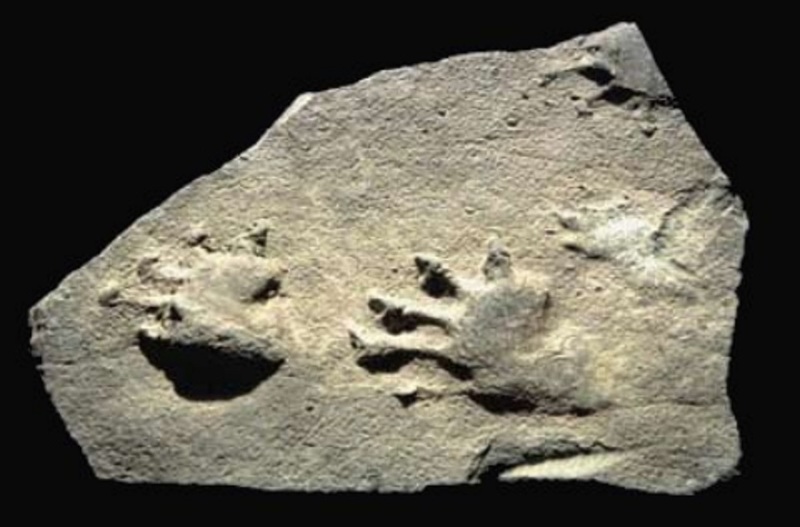 So maybe we don’t have any dinosaur fossils, but we do have these tracks of a pretty fell beast that was much closer to us than we’d like to admit. This is actually one of the better known Dimetrodon specimens. It’s not that hard to find replicas of the tracks for sale online.